Abstract. Model intercomparison studies in the climate and Earth sciences communities have been crucial to building credibility and coherence for future projections. They have quantified variability among models, spurred model development, contrasted within- and among-model uncertainty, assessed model fits to historical data, and provided ensemble projections of future change under specified scenarios. Given the speed and magnitude of anthropogenic change in the marine environment and the consequent effects on food security, biodiversity, marine industries, and society, the time is ripe for similar comparisons among models of fisheries and marine ecosystems. Here, we describe the Fisheries and Marine Ecosystem Model Intercomparison Project protocol version 1.0 (Fish-MIP v1.0), part of the Inter-Sectoral Impact Model Intercomparison Project (ISIMIP), which is a cross-sectoral network of climate impact modellers. Given the complexity of the marine ecosystem, this class of models has substantial heterogeneity of purpose, scope, theoretical underpinning, processes considered, parameterizations, resolution (grain size), and spatial extent. This heterogeneity reflects the lack of a unified understanding of the marine ecosystem and implies that the assemblage of all models is more likely to include a greater number of relevant processes than any single model. 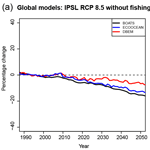 The current Fish-MIP protocol is designed to allow these heterogeneous models to be forced with common Earth System Model (ESM) Coupled Model Intercomparison Project Phase 5 (CMIP5) outputs under prescribed scenarios for historic (from the 1950s) and future (to 2100) time periods; it will be adapted to CMIP phase 6 (CMIP6) in future iterations. It also describes a standardized set of outputs for each participating Fish-MIP model to produce. This enables the broad characterization of differences between and uncertainties within models and projections when assessing climate and fisheries impacts on marine ecosystems and the services they provide. The systematic generation, collation, and comparison of results from Fish-MIP will inform an understanding of the range of plausible changes in marine ecosystems and improve our capacity to define and convey the strengths and weaknesses of model-based advice on future states of marine ecosystems and fisheries. Ultimately, Fish-MIP represents a step towards bringing together the marine ecosystem modelling community to produce consistent ensemble medium- and long-term projections of marine ecosystems. How to cite: Tittensor, D. P., Eddy, T. D., Lotze, H. K., Galbraith, E. D., Cheung, W., Barange, M., Blanchard, J. L., Bopp, L., Bryndum-Buchholz, A., Büchner, M., Bulman, C., Carozza, D. A., Christensen, V., Coll, M., Dunne, J. P., Fernandes, J. A., Fulton, E. A., Hobday, A. J., Huber, V., Jennings, S., Jones, M., Lehodey, P., Link, J. S., Mackinson, S., Maury, O., Niiranen, S., Oliveros-Ramos, R., Roy, T., Schewe, J., Shin, Y.-J., Silva, T., Stock, C. A., Steenbeek, J., Underwood, P. J., Volkholz, J., Watson, J. R., and Walker, N. D.: A protocol for the intercomparison of marine fishery and ecosystem models: Fish-MIP v1.0, Geosci. Model Dev., 11, 1421-1442, https://doi.org/10.5194/gmd-11-1421-2018, 2018.